During our weekend back in the Blue Mountains a few weekends ago to enjoy the autumn colours, hiking (as always) was on the agenda. 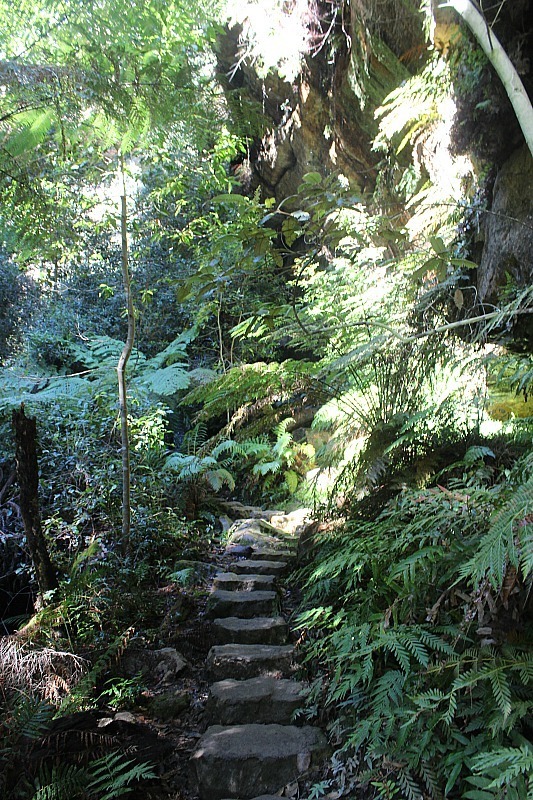 We have hiked numerous trails around Katoomba, Leura and Wentworth Falls including two of the biggies in the area– Wentworth Pass and Federal Pass – during previous visits. This time around we wanted to tackle the other must-do hike in the Blue Mountains that had so far eluded us: the Grand Canyon. The Grand Canyon is a narrow slot canyon located on the outskirts of Blackheath, and not an easy hike to get to without a vehicle. As this was the first trip we had been on to the Blue Mountains since buying a car, it was the perfect time to hike it. After a morning coffee in a sunshine drenched café in Leura village and a browse at the small local market we drove out to Blackheath to get hiking. Parking up at Neates Glen Carpark, we booted up then set out into the native bush. The initial descent was through dark forest dripping with the rain from the previous evening. Water flowed along sections of the path as we descended the steep stairs cut into the rock, deeper into the valley. We took our time on the muddy switchbacks, careful not to slip. It would be a long fall to the bottom. Tall eucalyptus trees with gnarled branches reached into the sky around the path. Tree ferns filled in the gaps to further block out the sun-light on a lower level. The forest was thick with nature. Reaching the bottom, we finally glimpsed the blue sky above and the steep rock walls rising up on either side of us. We were in the Grand Canyon. The path led us above the creek at first, along a well-worn but narrow trail. A few people passed us coming from the other direction as we made our way under rock overhangs and over small suspension bridges. The gurgling creeks below us made soothing melodies interspersed with native bird calls. Glossy green ferns fanned out and carpeted the forest floor. Waterfalls flowed from above and into the river at the bottom of the valley. The path took us through a waterfall that splattered fat drops on our heads as we passed beneath. Water surrounded us. On the valley floor we crossed the river on mossy stepping stones, pausing to soak in our incredible surroundings. Everything was still. Slowly the path began to rise up from the valley floor. The incline was gentle and it wasn’t long until we were above the canyon lip. Views of the gum tree covered mountains opened up to us below. The world was light again. Pine trees and dusty earth replaced the tree ferns and damp earth on the last section of the trail. Sharp rocks jutted out of the trail, acting as obstacles on the last climb. Evans Lookout came into sight, along with a large number of people that had driven there to see the iconic Blue Mountains view. It was beautiful but crowded. I always feel such a sense of accomplishment knowing I could have driven there but that I would have missed so much. It is the journey that matters, not the viewpoint at the end. The path continued through the forest parallel to the road and back to Neates Glen carpark. Feeling energised and happy, the flat tyre waiting for us couldn’t even ruin the high. I guess it probably would have if we hadn’t had a spare. Back on the highway we took a detour to Govetts leap, a spectacular viewpoint that looks over Bridal Veil Falls and sheer sandstone cliffs that drop hundreds of metres into the Grose Valley below. A quieter view than the better-known Echo Point but just as beautiful. We topped off the morning with lunch in Katoomba at my favourite place to eat, the Yellow Deli. It isn’t a visit to the Blue Mountains without a trip to the Yellow Deli for their wholesome food and hot apple cider. With a name like the Grand Canyon I was expecting a lot from this hike. Although it was nothing like the Grand Canyon in Arizona, it was still grand, and very beautiful. You can reach the Grand Canyon hike by car only. The turn-off is just before Blackheath Village if you are coming from Katoomba off the Great Western Highway. Follow the signs to Evans Lookout. There is parking at Evans Lookout, Neates Glen and Grand Canyon Loop Track carparks, any of which are a good place to begin the hike. Easy/Intermediate. The trail does have some uphill but it is not too bad. Whoa! I didn’t know this existed in Australia. It’s so strange seeing a canyon with dense trees instead of just bare rock! The hike through the jungle looks so fun and the Bridal Veils Fall is gorgeous! Beautiful! Your photos are always so lush – looks like an incredible hike! Again you took amazing photos.How long did the walk take?Love to see you do a three day hike from the Blue Mountains to Kanangra Boyd National park.Sydney bushwalkers club do a lot of these hikes but go into areas that have no walking tracks .They use compasses. Good on you Kate and you are very much an amazing outdoor lovely lady.